The Songcatchers Vibe Magazine photo shoot, Pioneer Square, Seattle, WA, 1994. "The best surprise of the day was... the Songcatchers, hailing from the Pacific Northwest. This band of Indians, African Americans and everything in between, simply blew the audience away..."
"Jaws drop at the sound of the dense other worldly interplay between Lavi's lyrical soprano wail, sax rifts rich in longing, and the blood rush of Native American singing and drumming... Native Americans don't write songs; they catch them--from a gentle breeze, from the faint sounds of laughter, from other gifts of nature. That same organic rhythm moves the Songcatchers." 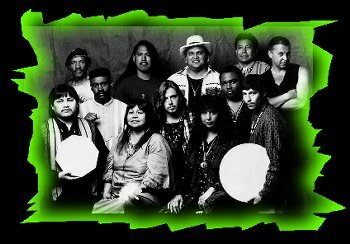 Winners of the First Americans in the Arts Outstanding Achievement in Music Award (aka Native 'Grammies') for 1994! A wonderful mosaic of melody, lyrics and images. A seamless blending of Native American traditional vocal and melodic style with modern rock, funk, jazz and spoken word. The Songcatchers have been on the cutting edge of the contemporary Native music scene and their live show is a true concert experience. Since their first release on A&M Horizon Records, they have been performing regionally from their homebase in the Pacific NW, and conducting their youth outreach songcatching workshops with Native tribal youth programs. 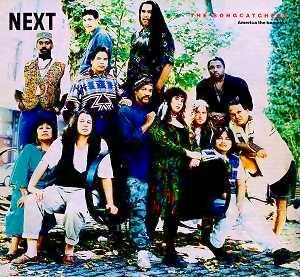 It all began in 1991, when Seattle-based singer/songwriter, Lara Lavi called Native American musician, Arlie Neskahi (Dine'), to ask if he would be interested in a collaborative project with her and two of her close musical friends, Charles Neville and Mark Cardenas. They met for breakfast on a foggy and damp Puget Sound morning at the Beeline Diner in Wallingford and the songcatching began. 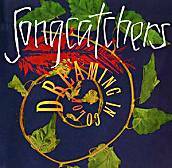 Since then the Songcatchers have toured with Peter Gabriel's WOMAD Tour, opened for the Neville Brothers on numerous occasions, and performed on several cross country tours.. The Songcatchers offer a dramatic musical journey into ancient and contemporary Native American musical experience. The music, poetry and visual imagery of the live performance speaks to the contemporary issues facing Native Americans and how the First Nations perceive themselves as indigenous people of "the 1990's" each with one foot firmly placed in their traditions and one foot venturing to the edges of a shrinking world. Born from a seminal jam session with a pow-wow group and a contemporary band, the Songcatchers created a powerful new sound. Their songs speak to the universal search for Spirit, Harmony, and Beauty. The lyrics tell stories of both ancient wisdom and contemporary determination and hope. The music ranges from thundering traditional dance songs to cascading Native vocals surrounded with cool jazz, rock or hard-hitting hip-hop rhythms. The Songcatcher sound, produced by 5 vocalists, and a 5 piece instrument ensemble is a true concert experience, textures rich with melodic hooks and spirited native vocal moments awash in enrapturing ambient keys. "The beat began like wind, then thunder in the mountains and it swelled like a heart turned inside out. Lavi let loose as she always does, her vocal chords stretching from pop to sad soul and definitely all the way to the last row"
"The Songcatchers are driven by an incredible spirit and provocative song writing. The Songcatcher's live show is a real experience, a truly original production."